I started out like most other culinary school dreamers. Fresh out of high school, I was accepted to attend the “Harvard of cooking schools,” The Culinary Institute of America, with scholarships including SkillsUSA and the Cream of the Crop. I went in wanting to be a cake decorator on a cruise ship—traveling the world making others smile one sweet bite at a time—and came out with the Katharine Angell Award for Academic Performance and a spot in the Food and Beverage Management Training Program at the Four Seasons Hotel in Washington, DC. A series of events laid the path for me to return home, and in doing so, I discovered my love for making smiles again, but this time with event catering, as the manager of a banquet facility, and as a regional corporate catering manager. I was home, close to family, and starting one of my own. My husband and I had our first son, and although he was perfect to us, he did have a few health issues that would need more care than a daycare facility could provide. Again, I was faced with a hard career decision: do I leave the industry I am so passionate about? In the end, I decided to learn a skill that would allow me to work from home but still care for my son. I traded the edible canvas for the digital canvas. I used my skills acquired at the CIA in design, composition, and business management to start a website design and development company. The kitchen is where I will always be the most comfortable and find the most joy. I kept feeling the pull of food, over the years, as my website business grew. I knew I needed to find a way to combine the two worlds to find fulfillment and joy in my career. It was almost a “duh” moment for me because I have always posted recipes and meal plans online for fun and my friends and family really appreciated it. I had been influencing the people closest to me for years, but how could I do this professionally? It turns out that a professional influencer is a real thing, so I started a YouTube Channel, a blog, and social media pages and posted images, recipes, and recorded videos. This is a marathon, not a sprint. Growing your audience and community takes a lot of time and effort on your part, with little return at first. You will not make money for a while when you start, and the people who do make money have been doing it for a long time. At first, your mom will be the only person liking and commenting on your content. Continue to produce good content that brings value to your target audience and your community will grow. Read, learn, and use your analytics. Listen to podcasts, read books, and take online courses because social media and the web are changing every day and you need to keep up. Analytics are your best friend, so use the numbers to help drive your decisions. Words hurt and some people are mean, but you need to ignore the haters. As long as you’re happy with the content you are producing and you’re happy doing it, then that is the only opinion that matters. My time at The Culinary Institute of America was some of the best of my life and I wouldn’t trade it for the world. It set me on the path to where I am today and gave me the skills and knowledge base that I use each day. I needed to pivot at a crucial point in my life and am so glad I did. I get to spend my days in the kitchen again, as well as out in the world interviewing other food professionals and trying amazing food. I love sharing my knowledge with others and the best compliment I get is when someone gives a recipe a try and tells me “my family loved it.” Food is about community. Whether that community is in person or online, it brings people together and that’s why I do what I do. In the end, I am just a wife, mom, and foodie sharing my passion with the world and loving every second of it! 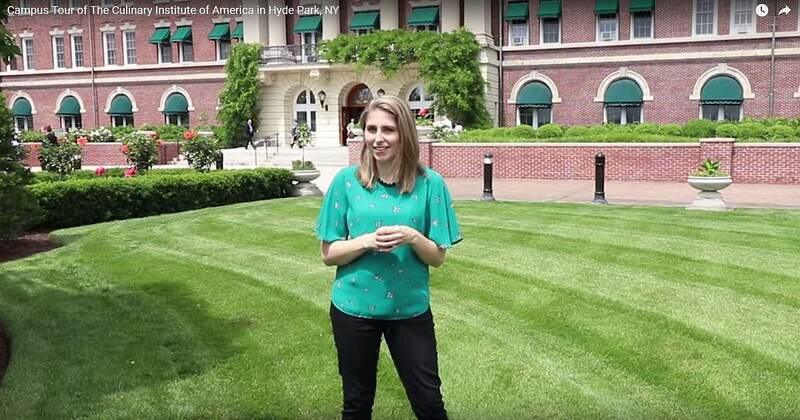 « CIA Hospitality Management: Q&A with Dr. Joy Dickerson	» Is The Culinary Institute of America Haunted?